Easily generate a new "Order Confirmation" pdf from Magento's Order Overview Screen, or from within an individual Order View page. 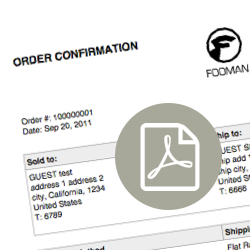 Print Order Confirmation pdfs for individual or multiple orders in bulk from the Order Overview screen. An Order Confirmation document contains the same information as an invoice, with the title “Order Confirmation”. You can print orders with any order status, even if they haven't been invoiced yet. If you select multiple orders, a bulk Order Confirmation document for all selected orders will be displayed in a single pdf document. Where can I find support for Fooman Print Order Pdf (M2)? Thanks for your feedback. As per our support conversation, the error message you encountered is unfortunately a general notice message for a package used by Magento itself. Install instructions did not work. I needed to extract the compressed files, move them to the /vendor/fooman/printorder-m2 directory and add: php magento setup:static-content:deploy to the procedure.